An Outpost of American comfort food just a short hop away from any location where the menu prices would have to compensate for higher rents, Hungry Bunny (1 Nguyen Cuu Van, D1) is a jewel-in-the-rough venue you’ll definitely want to hunt down, if only to get in early before this takes off as a fashionable nightspot away from the main drag. It’s neatly tucked away just off a twist in a lesser-used thoroughfare that cuts through the area between Districts 1 and 2, and those who are actively seeking it out will be amply rewarded by genuinely tasty, home-style heart-of-the-USA dishes in a clean, striking venue surrounded by unassuming local businesses and beer dives. Hungry Bunny’s black and white interior is evenly lit by street-lantern wall fixtures with heavy incandescent bulbs and a funky ceiling installation made with offcenter rings of neon: the restaurant’s real gem, however, is its cage-concept rooftop bar, which has yet to open but is likely to become virally popular once the finishing touches are made. The casual diner is more or less a one-man-show fronted by Cuong Doan, a recent returnee from the US for whom entrepreneurship in the F&B business has been the answer to his own fascinating existential crisis—ask him for more details. The restaurant serves as the ultimate solution to the skills he acquired as a kitchen hand and Starbucks barista back in the States, as well as his self-professed love for all things burger, from McDonald’s through to gold leaf New York. Hungry Bunny is Danny’s serious attempt to make his penchant for American-style gourmet burgers a legitimate business— and with the right ambience and service, a focused, well-executed menu, and an enthusiastically-realized interior design, he’s clearly got all the elements lined up in the right places. It’s a tight ship for now, and the short lineup of dishes on offer are only the first draft for an expanded range promised to be in the works. The advantage to this is that the condensed list of available options plays to the chef’s strengths—confidently and expertly prepared, the taste and quality of everything that comes out of the kitchen is guaranteed. We take some simple starters. A cream of mushroom soup (VND65,000) with its toasty croutons has a pleasingly warm, buttery character and smooth consistency to it. 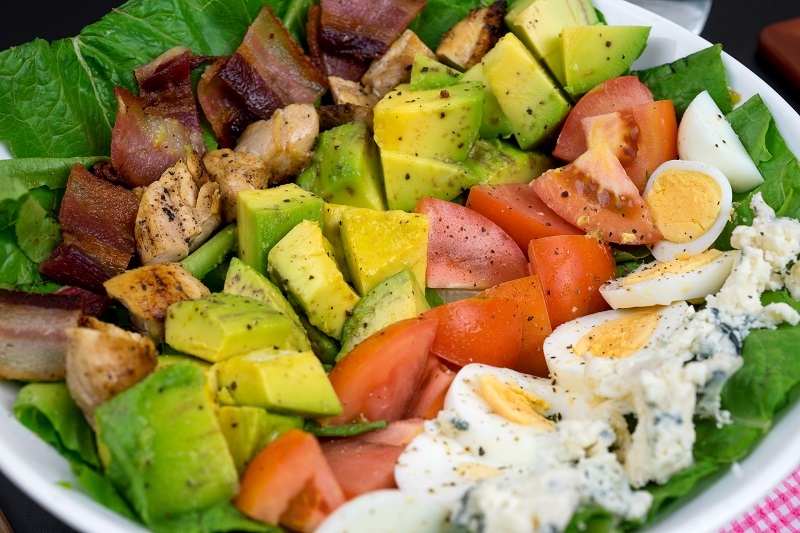 The waiting staff recommend a slightly unorthodox American cobb salad (VND130,000) in a generous-enough size to serve as a main; it is overwhelmingly clean-tasting with its avocado and crispy romaine lettuce enhanced by a whiff of blue cheese and big chunks of chicken and bacon—and comes served with a special house ranch dressing in a gravy jug that you’ll want to apply lavishly. 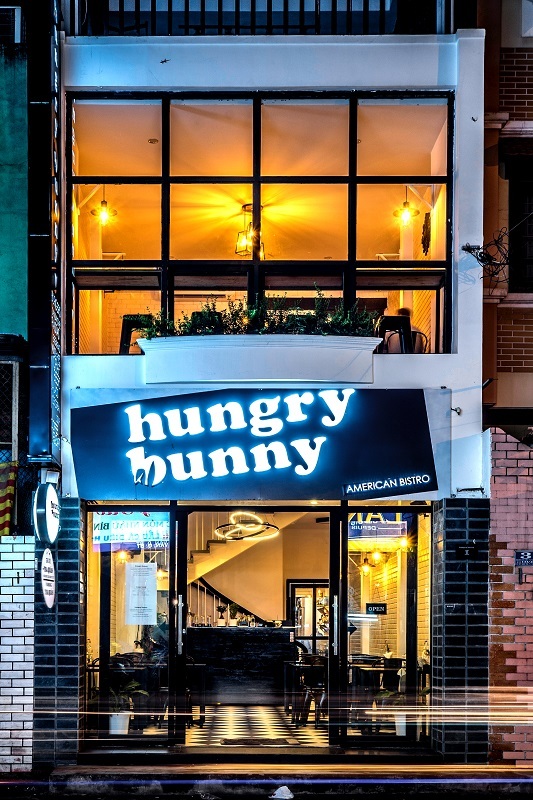 Hungry Bunny should be judged first and foremost for its burgers, and it’s certain that diners who stick to the signature range are going to find themselves well-fed. 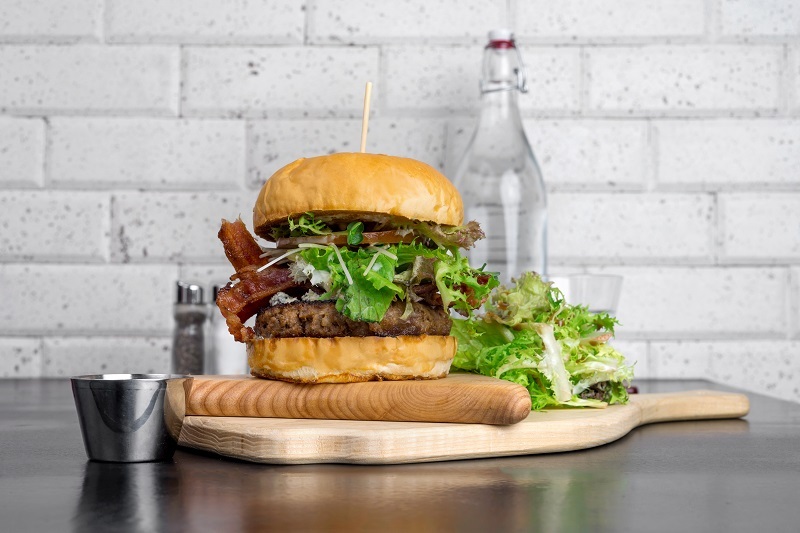 The hamburgers are heavy and classically built with bulging beef patties balanced by their salad elements. We had a very refined Bacon & Blue (VND140,000), a richly pungent creation with crispy bacon, blue cheese crumble, tomato, spring mix and blue cheese aioli—as well as a Bacon Clubhouse (VND135,000) with a sweet house cocktail sauce and caramelized onions, soaked in a mild melted white cheddar. 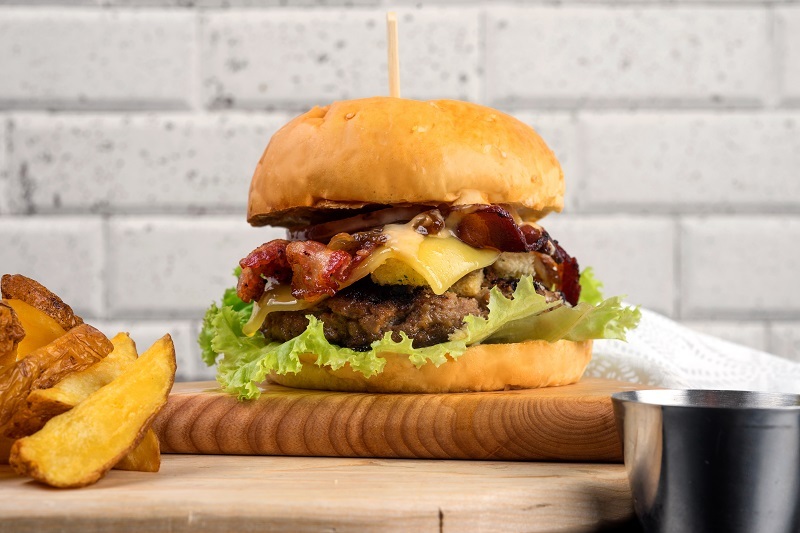 These are heavy burgers, with thick 160-gram patties of pressed minced beef thoroughly infused with their respective cheeses that hold together firmly in the burger and break up easily in the mouth, radiating their latent heat. Hungry Bunny burgers hold their own against gourmet burgers twice their price served in more upmarket locations; they’re both authentic in taste and creative in their ingredients, and come served with some chunky hand-cut fries in jackets perfectly-prepared without overuse of oil and paired with a pleasingly intense ketchup. Don’t be concerned if you’re not up for a burger—you’ll be well-pleased with a selection from the several pastas on offer. 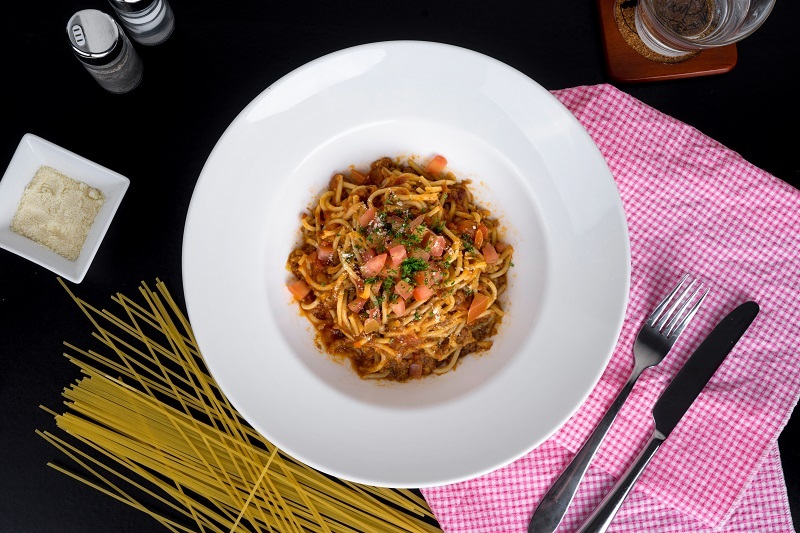 We tried a flawless spaghetti Bolognese (VND125,000) with a welcomingly familiar and balanced meat sauce that stood out as a contradiction to the restaurant’s more urban surroundings. The restaurant is also said to put on a good mac & cheese and creamy chicken alfredo, while listing a few interesting sandwich options as well. Hungry Bunny will really get kicking once the rooftop’s ready so that guests will be able to follow up hearty meals like these with open-air craft beers and glasses of wine. Ice creams and desserts are promised to be feature menu items in the near future, making this a venue to keep an eye on. For now, you wouldn’t be ill- advised to hit Danny up for a cup of his very good coffee: having invested in a superb machine as well as some one-on-one coaching to undo the Starbucks automaton training, the K-Coffee brew is worth a visit to Hungry Bunny in and of itself.